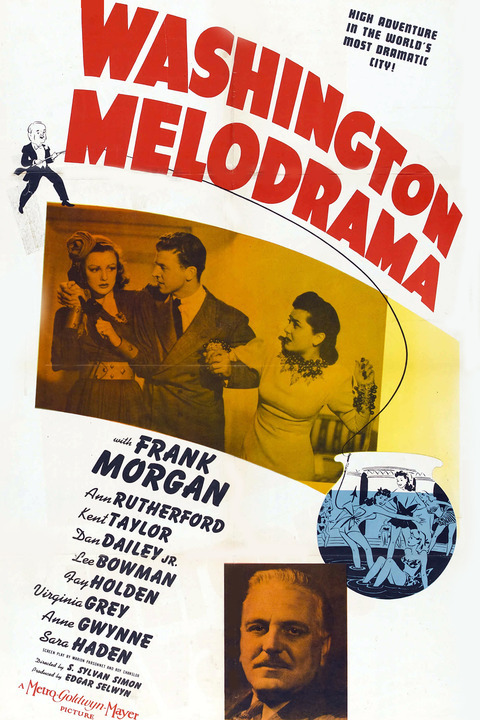 Politics, big business, showgirls and murder all collide in 1941’s Washington Melodrama, directed by S. Sylvan Simon. Industrialist Calvin Claymore (Frank Morgan) is the head of a group that supports a bill to send financial assistance to Europe during the war. Battling against Calvin is Hal Thorne (Kent Taylor), a man of isolationist beliefs who runs a newspaper, the Daily Tabloid. When Calvin heads off with a Senator friend to the Marigold Club because he’s feeling lonely, he gets more than he bargains for, “hooking” one of the showgirls during their fishing-themed water ballet performance. Much to everyone’s surprise (including Calvin’s wife and daughter, portrayed by Fay Holden and Ann Rutherford respectively), the dancer, Mary (Anne Gwynne), forms a very solid friendship with Calvin. But when Mary turns up dead, Calvin becomes a suspect – and pesky Hal Thorne is still looking for any scoop he can publish that will derail the goals of Calvin’s political group. Washington Melodramadoes a great job of setting up the fast-paced, politically oriented environment of Washington straight from the opening. This establishment doesn’t do too much good, though, when it becomes clear that the film is a mystery-drama rather than a political drama. Don’t be fooled by the lighter moments or the D.C. edge. The political conflict between Calvin and Hal is a great touch and certainly gives them solid motives to plot against each other, but it takes a back seat to the murder itself. 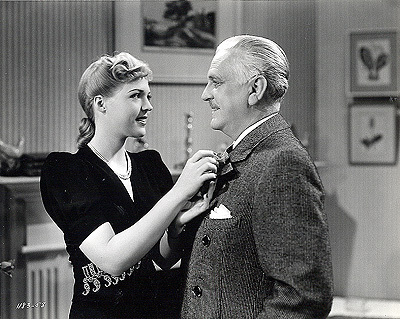 Frank Morgan is wonderful as usual in this film, and as always I’m left wondering why he isn’t so well-remembered today. His character is very likable here: a kind, steadfast man who gets mixed up in the murder case of someone he truly cared for and never would have harmed. Morgan builds great sympathy for the already sympathetic character. Ann Rutherford is also quite convincing as the daughter of Morgan’s character. Laurie Claymore is the type of girl who is willing to do anything to stick up for those she loves. She’s determined, caring and very sharp. Rutherford plays the role strongly, boldly, but not over-the-top. TCM shared this film as a part of their tribute to Rutherford after she passed away in June, and it’s certainly a fitting choice to showcase her talent.